Fibersol®’s line of fiber ingredients allows you to develop cereals for health conscious consumers that gives them all the dietary fiber they need without sacrificing the taste, aroma and texture they want. And with the other functional benefits such as replacing calories from sugar and fat, along with providing an increased feeling of satiety, you can have it all with Fibersol®! 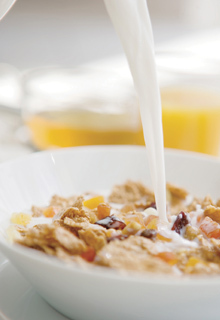 Fibersol® can be used to enhance the dietary fiber content of a number of cereal applications, both through the addition of Fibersol® into the base cereal as well as through cereal coatings.